What’s most fascinating about Will You Be My Neighbor?, the documentary about children’s TV host Fred Rogers, is how he sounds the same whether on camera in his TV environment, in interviews, or testifying in front of Congress on behalf of PBS. Mr. Rogers was the same person on camera and off. Pittsburgh native Rogers postponed his goal of being ordained as a Presbyterian minister after discovering that children’s programming in the new medium of television was filled with violent slapstick and noisy commercials directed at children. He immediately detoured on a mission to use television to reach children on a quieter, more personal level combining entertainment with valuable life lessons. Mister Rogers’ Neighborhood ran for 31 seasons, providing daily affirmation for generations of kids who grew up with him and his cast of human and puppet characters. A calming, reassuring, leisurely respite from loud, frenetic kiddy fare, Rogers’ show explored feelings of love, anger, frustration and fear, frequently through the character of Daniel Tiger, a soft-spoken hand puppet that was, in a sense, Rogers’ alter-ego. Rather than avoiding difficult issues, Rogers addressed them in ways youngsters would understand. His ongoing theme was that each child is unique and special. Rogers provides the film’s narration, culled from earlier interviews. He died in 2003. Family members, colleagues, and friends, including classical cellist Yo-Yo-Ma, provide reminiscences and anecdotes. His widow, Joanne, offers the most private, humorous recollections and insights of her husband 50 years. A key episode shows Rogers cooling his feet in a plastic pool when African-American Officer Clemmons (Francois Clemmons) stops by and Rogers invites him to take off his shoes and socks and join in. At the time there were protests against blacks sharing swimming pools with whites. This was Rogers quiet way of countering real-life bigotry. The movie cuts to actual news footage of a public pool manager pouring bleach into the water to bully black swimmers into leaving. Major events that coincided with the run of the show included the Vietnam War and the assassinations of Martin Luther King and Robert Kennedy. Rogers is shown explaining what “assassination” means rather than completely avoiding the subject, the easier route. He knew that people would be talking about it and kids would hear the word. He addresses disabilities in an episode with a paraplegic boy. Rogers and the boy talk about how his condition arose and then sing together. The moment is particularly touching because the boy is thrilled to be talking to his hero and Rogers conveys genuine interest in the boy. In his gentle and disarming way, Rogers teaches that disabilities are nothing to be ashamed of or to be mocked. There are many clips from the show both in black-and-white and color. The black-and-white footage lacks the sharpness viewers have come to expect, primarily because of its age. Behind-the-scenes footage shows the Neighborhood set with the famous door that Mr. Rogers opened each day to enter and sing his greeting theme. Though the episodes were scripted, Rogers made each one appear spontaneous, whether speaking directly to his audience or taking them into the Neighborhood of Make Believe, populated by hand puppets King Friday XIII, Queen Sara Saturday, Lady Elaine, Henrietta Pussycat and others. Director Morgan Neville (20 Feet From Stardom) offers both a study of the man behind the TV show and a stroll down Memory Lane, if you were a child during the show’s run. Surprisingly, he doesn’t include comments from some of those former viewers. We do see Rogers speaking with a large group of children as their parents watch and listen, equally charmed. Because Rogers’ life was scandal-free, the film is a 90-minute love letter to the man. The point is made early on that he was an original, authentic and dedicated, and much of what follows simply reaffirms rather than sheds new light. The contrast between the kindness and gentleness shown in the film and the current divisive atmosphere in Washington and the country in general is striking. It makes you wish there were more people like Fred Rogers in charge. 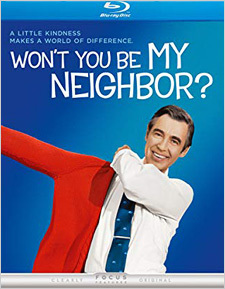 Universal and Focus Films have released Won’t You Be My Neighbor? on Blu-ray in 1080p HD in the 1.85:1 aspect ratio. The video quality is only fair, but is as good as it needs to be. The documentary is composed of a variety of sources, from old analog video recordings, to 8 and 16 mm film sources, to professional cameras for new interviews, which means you can’t expect a reference experience. The sound is clear and clean, presented in English 5.1 DTS-HD Master Audio. The surround channels are only very lightly used for music and atmosphere, as you might expect. Optional subtitles are available in English only. The disc features no extras, nor even menus; the film simply starts playing when you insert the disc. Won’t You Be My Neighbor? is rated PG-13.